In my previous post, I gave an overview of Fund for Peace’s methodology for the Failed States Index and offered some brief thoughts on how the index may or may not be useful. This post will focus on how Africa (scoped to exclude Egypt and South Sudan for reasons mentioned in the previous post) fares in the 2012 Failed States Index. Between 2007 and 2012, 14 countries’ scores have improved: Seychelles, Cape Verde, São Tomé and Príncipe, Sudan, Malawi, Côte d’Ivoire, Zimbabwe, Sierra Leone, Republic of the Congo, Lesotho, Burkina Faso, Equatorial Guinea, Chad, and Namibia (in order of most improved scores). On the other side of the scale, 38 countries’ scores got worse during this timeframe. Not all of these countries are necessarily the weakest on the continent, but some may be weakening at such a rate that they may be increasingly vulnerable to catalysts (i.e., coup, natural disaster, mass population displacement) that could send them “over the edge.” According to Failed States Index data, the five countries on the continent that have weakened at the most rapid rates since 2007 are Libya, Senegal, South Africa, Tunisia, and Guinea-Bissau. Libya has been categorized as a Warning country since 2007, but its score was 18.41% higher (indicating relative state weakening) in 2012 than it was in 2007. South Africa was categorized as a Sustainable country in 2007, but its score was 14.2% higher in 2012 than it was in 2007. Since 2008, it has been categorized as a Moderate country. Tunisia has been categorized as a Warning country since 2007, but its score was 11.65% higher in 2012 than it was in 2007. Guinea-Bissau has been categorized as an Alert country since 2007, but its score was 10.48% higher in 2012 than it was in 2007. Benin has been categorized as a Warning country since 2007, but its score was 8.43% higher in 2012 than it was in 2007. Eritrea was categorized as a Warning country in 2007, but its score was 9.52% higher in 2012 than it was in 2007. Since 2009, it has been categorized as an Alert country. The takeaway from this level of analysis of the Failed States Index is not that countries like Senegal and South Africa are failing, but that countries like Guinea-Bissau and Eritrea, which are already starting from a relatively compromised position, and deteriorating at a considerable pace year-to-year. At least that’s one way I see the index potentially being useful. Thus ends my brief analysis of the 2012 Failed States Index and what it may or may not tell us. Take from it what you will. Last week, Fund for Peace released the 2012 Failed States Index. Accordingly, my next two posts will cover my thoughts on how the index may or may not be useful (Part I) and how Africa fares on the index (Part II). But before I start, two important caveats: First, if you are looking for a debate on the utility of using the terms failed state, weak state, collapsed state, etc. and the policy implications that accompany that designation, this post is not going to do that for you, as that topic has been covered in-depth elsewhere. 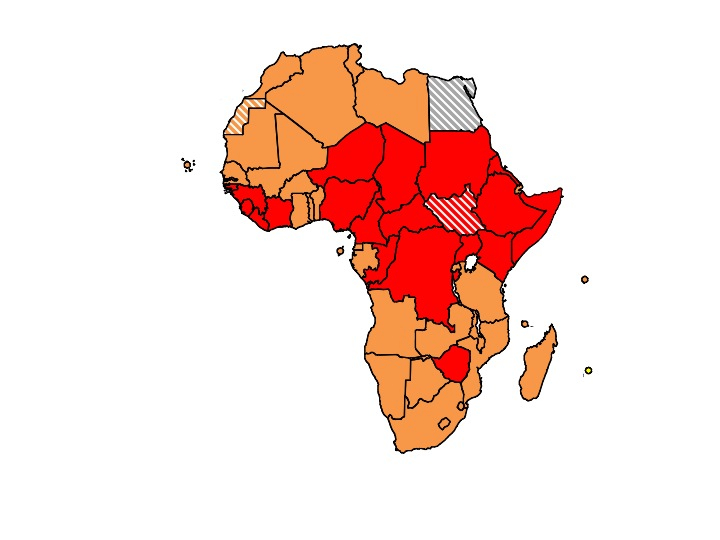 Second, when I turn to what the index means for Africa, I’ve scoped “Africa” to include 52 countries. I’ve excluded Egypt because I’m just accustomed to scoping the continent accordingly because it’s not in the AFRICOM AoR. Like the 2012 Failed States Index, I’ve also excluded South Sudan, which became a state midway through the year. Though unranked in the 2012 iteration of the Failed States Index, Fund for Peace did determine where South Sudan would have ranked, had it been included. Every year, the Fund for Peace triangulates data collected using content analysis, quantitative data, and qualitative input to develop final scores for the Failed States Index. Aggregated data are normalized and scaled from 0-10 (best to worst) for each of 12 indicators that span three categories – social, economic, and political/military. No single indicator is guaranteed to indicate state instability, as they cover a wide range of state failure risk elements. Failed States Index scores range between 0.0 and 120.0 (least failed to most failed), and the Fund for Peace categorizes the Failed States Index scores by quartiles: Alert (scores between 90 and 120), Warning (scores between 60 and 89.9), Moderate (scores between 30 and 59.9), and Sustainable (scores between 0 and 29.9). Data for each year’s index is collected between January 1 and December 31 of the previous year. As a result, each year’s Failed States Index would not account for developments that took place after December 31 of the previous year. This is important to keep in mind when trying to make sense of where each country lies in the index in light on current developments. You can find out more about the Fund for Peace’s methodology here and here. The Failed States Index is not a crystal ball. It is not intended to predict when, how, or under what circumstances a state will fail. It is merely an analytic tool that suggests which states may be more vulnerable to state failure than others. Furthermore, one should not read too much into a country’s numbered ranking, because ultimately ranking one state as slightly “more failed” than another is meaningless. It is, however, more useful to think of the data the index provides in terms of tiers or categories (i.e., Somalia is more vulnerable to state failure than Malawi, and Malawi is more vulnerable to state failure than Mauritius). Finally, what is even more important than rankings or categories are the changes in the country’s scores over time. Looking at the Failed States Index from year to year, one can see that many of the countries that top the list have topped the list every year – some just trade places with each other. So if a policymaker or military strategist was trying to make sense of this index, one takeaway is that there are countries that are chronically vulnerable to state failure, but absent a specific catalyst (i.e., coup, natural disaster, mass population displacement), it is unlikely that the state is going “over the edge,” so to say. What they then do with that information will of course depend on whether or not a particular state’s failure matters to their country, or even to their bureaucracy. For the past two decades, Kenya has pursued a multilateral and primarily diplomatic approach to Somalia’s instability. However, in October 2011, Kenya launched an invasion of southern Somalia to dismantle al-Qaeda-affiliated Harakat al-Shabaab al-Mujahideen, and thereby ensure Kenya’s national security and territorial sovereignty. Yet, there appears to be a notable disconnect between Kenya’s stated objectives in Somalia and the level of effort required to achieve its desired end-state. Al-Shabaab is but one symptom of Somalia’s enduring security, political, and humanitarian challenges; as such, the demise of al-Shabaab will not necessarily eliminate the many threats flowing over the Kenya-Somalia border. This article provides a context for Kenya’s invasion of Somalia, and highlights key challenges that may preclude Kenya’s military operations from stabilizing the country. What I’ve gathered is that militarily, the situation in Somalia is improving. In addition to Kenya taking Afmadow at the end of May, we’ve seen troops from the African Union Mission in Somalia (AMISOM) and the Transitional Federal Government (TFG) expanding their control outside of Mogadishu to Afgoye. Ethiopian troops operating outside of AMISOM have been working with Ahlu Sunna Waljama’a (ASWJ) to hold territory in central Somalia and along their common border. Notably, they have not committed the same mistakes they did during their 2007-2008 occupation of parts of Somalia, and they say that they do not intend to remain in Somalia for very long. That said, when Ethiopia and its local allies withdrew from the city of El Buur earlier this month, al-Shabaab reportedly retook the town and beheaded two individuals believed to have collaborated with the Ethiopians. While this does not mean that al-Shabaab is resurgent, it does demonstrate a need for all forces pursuing al-Shabaab to be able to protect civilians from such retributions in the future. Another issue to track is possible human rights violations that may occur as TFG troops move in with AMISOM forces. While al-Shabaab was reviled for its draconian measures employed to control the population, I am told that they do have a relatively favorable reputation when it comes to maintaining law and order. And it would be a tragedy to have the population turn against troops that are either TFG or TFG-affiliated at the same time when they are supposed to be warming to the idea of a central government come August. I’ve also gathered that the international community has much more faith in the progress in the political transition in Somalia than may actually be warranted. Without getting into too much detail on the end of the transition that is expected by August 20, the sense that I get is that the composition of the post-August 20 government may differ very little from the government that has been so instrumental moving Somalia forward over the past 8 years. (Please note my sarcasm here.) I’ve also been told that there’s a sense that this transition is externally imposed (by Uganda, the AU, UN, US, etc) and most critically, lacks sufficient Somali ownership. Another concerning element is that there is a tension between the need to demonize radical elements of al-Shabaab while simultaneously needing to include them in the transition process – if even for their reputation for maintaining law and order. The equities of the various stakeholders involved in the Somalia transition process with regard to this last point seem mutually exclusive, and I’m not sure how this is all going to get sorted out. What I didn’t get a sense of, however, is to what extent elements of Somali society are exhausted with war and want peace at any cost vs to what extent other elements of society have an interest in maintaining conflict. Thus, we get to a point that was made by one of my instructors this week about the current situation in Somalia – “military ahead of politics” – meaning that the relative successes we’ve been seeing on the military fronts may not mean much if the political process falls apart or doesn’t result in increased stability across Somalia. Lesley on Africa is in love. I’m in Kilifi, Kenya right now attending the Rift Valley Institute’s Horn of Africa course and I’ve developed multiple very serious intellectual crushes on the course lecturers. These are some of the world’s leading experts on Somalia, Ethiopia, Eritrea, and Djibouti, and for 84 cumulative hours this week, they are at my disposal so that I can get smarter on this region. I’d had doubts that taking this course at significant personal expense (six weeks salary and six vacation days) was worth it, but I’ve learned more in these first three days than I have in the past 7 months and 20 days of Beltway brain-rot. I only wish I could keep learning, but alas, life is not fair. So tonight, to reward myself for my nerdiness and dedication, I decided to take myself on a dinner date. Every time I come to the Coast, I insist on eating at Porini Seychelloise Restaurant, which is midway between Mombasa and Kilifi. I hadn’t expected to be eating alone, so I’d ordered pretty much everything on the menu – enough for 3-4 people. When I showed up alone, I was worried that I’d be wasting so much food. But when the stewed beef, stewed chicken with coconut milk, jumbo creole prawns, and fish in coconut milk came out, I knew I’d eat enough for two and a half of my absent colleagues – at a minimum. 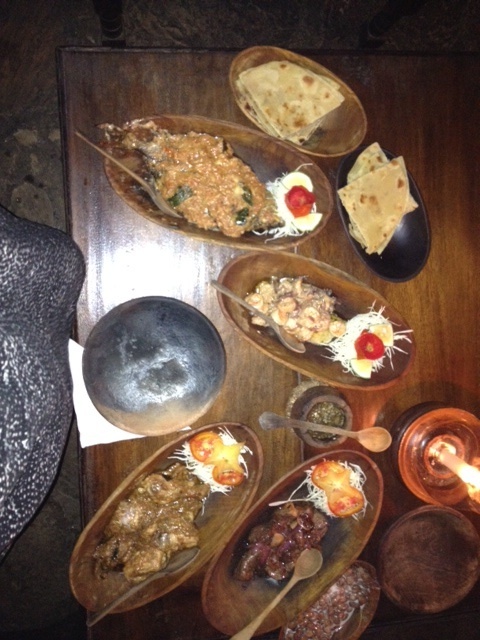 Left to right: Chapati, Coconut milk fish, Jumbo creole prawns, Coconut milk chicken, Stewed beef, Beans with coconut milk. When I was done stuffing my face, the exceedingly personable owner of the restaurant came up to chat. I told her this was my favorite restaurant on the Coast, and that I insist on coming here every time I’m in the area. After we exchanged a few more words, she said “Oh. I know you.” And I start wracking my brain for how my reputation has preceded me when I have only been there three times. She continued, “You were here a few months ago with those important guys. One of my waitresses remembers you because you were telling them off and we were so amused.” I smiled sheepishly. I liked her characterization of me, but it also reminded me that I needed to be extra careful to conceal my cheeky, opinionated American side in certain situations. Haha…oops. So now I’m back in my hotel room, laptop perched precariously on my protruding stomach, wishing I could hire someone to rub my belly as I doze off to sleep. The food at Porini is so rich and flavorful, that it’s hard to imagine that there’s not some sort of narcotic sprinkled on top. I mean, the stuff is culinary crack. How can I find another excuse to travel here and get my next fix? My initial take on this paper is that it’s a more detailed strategy than the points first articulated in the 2009-2010 timeframe, but the substance of the Administration’s priorities is essentially the same. Furthermore, I suspect that the release of this strategy – in light of the ongoing “rebalancing” towards the Asia-Pacific region – is a means by which the Administration can attempt to assure Africa that it is not being forgotten.